Patrick Kelly of Rockport (right) sizes up Rafael Velado during their New England Fights amateur lightweight title fight on June 17, 2017, in Lewiston. The upcoming New England Fights mixed martial arts show scheduled for Sept. 8 at the Cross insurance Center in Bangor will have a distinct local flavor. Nearly all of the top local combatants save for recently crowned CES MMA featherweight champion Bruce Boyington will be competing on a card announced Friday that includes six professional bouts and 11 amateur contests. This will mark NEF’s fourth show in the Queen City, with the promotion’s Bangor debut at Darling’s Waterfront Pavilion in 2013 followed by cards at the Cross Insurance Center each of the past three years. The main event matches two Bangor-area fighters from different gyms in a lightweight (155-pound) battle as Aaron Lacey (5-2) of Young’s MMA in Bangor takes on Jonathan Lemke (7-8) of Titan Athletics in Brewer. Aaron Lacey after his 2016 win during New England Fights at The Androscoggin Bank Colisee. The co-main event has reigning NEF lightweight champion “The” Ryan Sanders (16-9) of Young’s MMA facing Armando “Big Chino” Montoya (10-6) in a nontitle welterweight (170-pound) encounter. 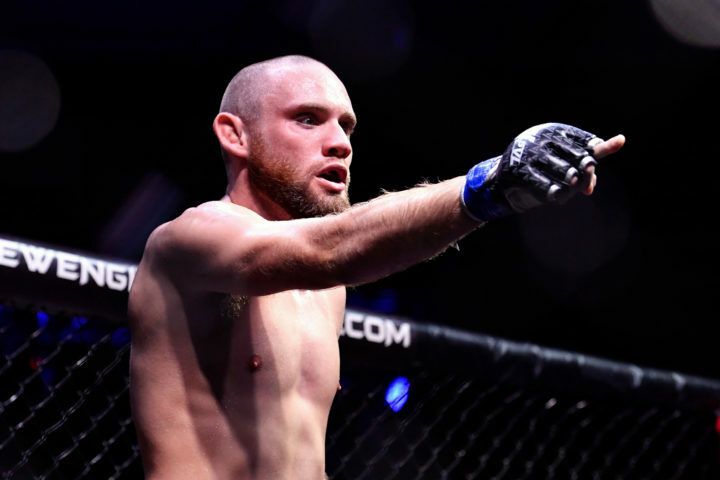 Sanders is 9-2 overall and 8-1 as a lightweight since turning his attention to the 155-pound division after his pro career got off to a 7-7 start primarily in the welterweight division. Montoya fought for a decade in the western United States before relocating to Maine where he and his family have relatives. 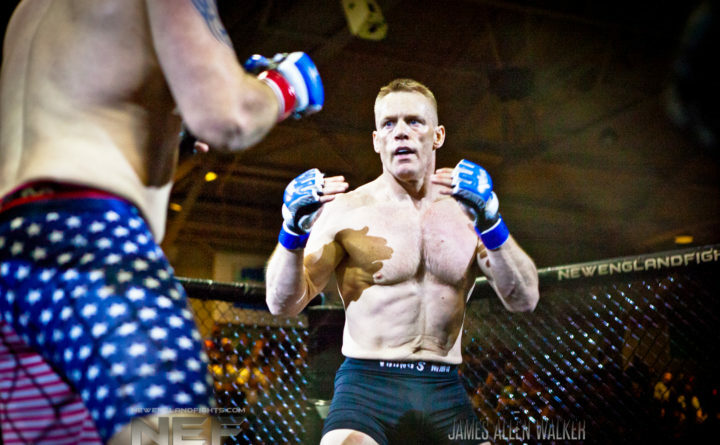 He now trains out of First Class MMA in Brunswick and will be making his NEF debut against Sanders. In other notable pro bouts, former NEF amateur featherweight champ Caleb Hall (1-0) of Dixfield and the Choi Institute of Portland will battle current NEF pro middleweight title holder C.J. Ewer (3-1) of Hampden and Young’s MMA at 155 pounds. Undefeated Josh Harvey (4-0) of Young’s MMA will return to the cage to face veteran Jay Ellis (15-77) in a lightweight contest. Patrick Kelly, the 54-year-old wrestling coach at Camden Hills Regional High School in Rockport, will defend his 4-0 record and NEF amateur lightweight championship against late replacement Ed Forlenza (2-2) of Hyannis, Massachusetts. This bout originally was scheduled as a battle of the unbeatens but Kelly’s original opponent, 2-0 Tim Manning, dropped out due to injury. Kelly won’t be the only wrestling coach in the cage Sept. 8. Shawn Costigan, part of the Bucksport High School coaching staff, will take on David Hills in a clash of debuting amateur featherweights (145 pounds).